There is no doubt that soccer is the most popular sport in the world. It’s popularity has been increasing steadily in Australia over the past fifteen years and I think the game is going from strength to strength here. In terms of audiences and television coverage, it is still behind Australia Rules Football and Rugby League but it is starting to catch up. In this podcast, I would like to talk about soccer in Australia. Soccer was first played in Australia in 1880 so it’s been here for a long time. But it was Australian Rules Football which proved to be more popular through the last century. Soccer was always popular with migrants who came from England and European countries but it never seemed to be as popular as Australian Rules Football. For instance, I grew up in the late 1950s and the 1960s in Western Australia. We never played soccer at school. It was a game that was mostly played by migrants because it was very popular in the countries where they came from. That’s about all we knew about soccer. Soccer was certainly popular in the big cities where there were large migrant populations. In fact, when my wife and I were living in Sydney in the early 1990s, it was soccer that our oldest son played as his first organized sport when he was about 7 years old. I can remember our Saturdays watching him play. His coach was from England and I loved the way he taught the boys how to love the game of soccer. By 2006, there were about 1 million children and adults playing soccer in Australia. That was more people than either of Australian Rules Football, Rugby League or Rugby Union can boast. But at that time it didn’t have the profile of the other three football codes and there were fewer people watching the sport, either at the games or on television. The first national soccer competition had started in 1977, but it had never become really popular and finally ceased in 2004. It was the creation of a new national soccer competition in 2005 which saw soccer in Australia really start to take off. The new national competition is called the A-League. It has been a great success so far. An A-League match between Newcastle Jets and Sydney FC at Newcastle Stadium, 3 November 2007. The A-League is a national competition with 10 teams, including 9 from around Australia and 1 from New Zealand. There are two teams from each of Sydney and Melbourne and one team from each of Adelaide, Brisbane, Perth, Newcastle and the Central Coast of New South Wales. Finally, there is a team from New Zealand, being Wellington Phoenix. The regular season games are played in the Australian summer, from October to April, when each team plays each other team 3 times. The team finishing on top of the ladder is called the A-League Premier. The top 6 teams from the A-League competition then compete in the Finals Series to find out who will be the A-League Champion for the season. The A-League Champion in 2014-15 was Melbourne Victory. 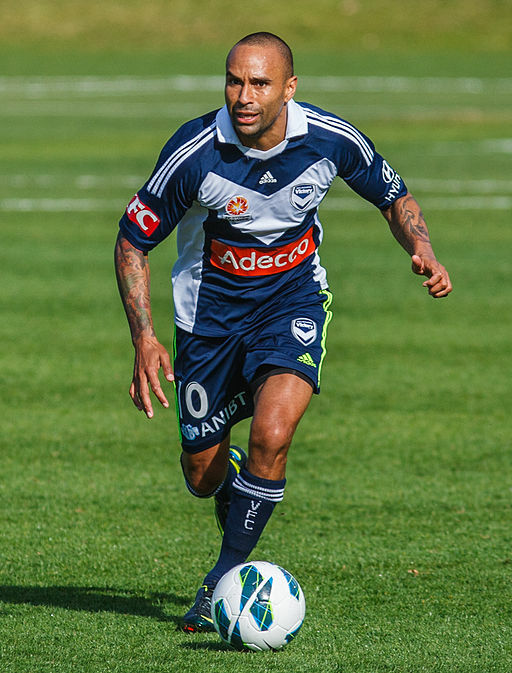 Archie Thompson playing in a pre-season game between the Central Coast Mariners and Melbourne Victory on 16/09/2012. The A-League Premier also gets the opportunity to compete in the AFC Champions League competition, which is a competition of the 32 best club teams from countries all around Asia. In 2014, the A-League Premiers of 2012/13, the Western Sydney Wanderers, were good enough to win the AFC Champions League competition. That was a wonderful feat, especially as the Western Sydney Wanderers only joined the A-League in 2012/13. Aside from the A-League, the other major soccer successes have been the performances of the Australian Team. Everybody calls them the Socceroos. We are most proud of the Socceroos’ successes at the World Cup. They first competed in the World Cup in 1974 and then followed a long period where they were unable to qualify to play at the World Cup. That all changed in 2006. After 32 years, the Australian Team finally qualified by beating Uruguay in Sydney in front of 82,000 screaming fans. That was an amazing game. It was the second of two matches with Uruguay. Uruguay had won the first match 1 – 0, which was played in South America. So Australia had to win the second match by at least 2 goals, in order to qualify for the World Cup. At the end of full time, the score was Australia 1, Uruguay 0. So the aggregate for the two games was 1 goal to each team. Next they played 30 minutes of extra time, but still the scores were locked at 1-0. That meant they had to go to a penalty shootout. I can remember watching this on TV, along with millions of other Australians. Our goal keeper was Mark Schwarzer. He somehow managed to save 2 goals in the penalty shoot out and that was enough for Australia to qualify. What a match and what excitement. In the World Cup competition in 2006, Australia played really well and went on to finish 16th out of the 32 teams which qualified. In their last game, they were beaten 1-0 by Italy. Italy went on to win that World Cup. It was our great performance in that World Cup, along with the start of the A-League in Australia in 2005 which really helped soccer to become a real force in sport in Australia. We qualified for the World Cup again in 2010 and 2014. In 2015, Australia won the Asian Cup against Korea, 2 goals to 1. With wins like that, Australian soccer can only get bigger and more popular in the years to come. Panoramic image of the Melbourne Cricket Ground during a friendly international football game between Australia and Greece on 25 May 2006. Podcast 63 Quiz - Did you understand the podcast? True or False? – Soccer is the most popular sport in Australia. True or False? – Migrants to Australia played mostly soccer because that’s what they played in the countries they came from. True or False? – Rob’s oldest son played soccer when he first started playing organised sport. True of False? – When the A-League was created in 2005, soccer really started to take off in Australia. True or False? – The A-League Champion is the team which finishes on top of the ladder in the regular season. True or False? – The Western Sydney Wanderers became the A-League Premiers in their first year in the A-League. True or False? – The Socceroos first competed in the World Cup in 2006. True or False? – Australia had to beat Uruguay by at least 2 goals to qualify for the 2006 World Cup. True or False? – The Australian goalkeeper Mark Schwarzer kicked 2 goals in the penalty shoot out. True of False? – Rob thinks that the performances of the Socceroos and also the A-League are very important in soccer becoming a real force in Australia. Australian Rules Football = a type of football played in Australia. See podcast 2. Hi Rob, thank you for having responded to me: You are a kind and definitely nice. I ask to satisfy my curiosity ‘about the discovery of your country at the hands of James Cook. In Europe there ‘who says that who killed the kangaroo and brought to shoulder by an Aborigine, the view of the British was grounded as a sign of welcome pronouncing the word “kangaroo”, that is welcome. In your opinion, and ‘a legend or it’ s true that you say? Excuse me if I make mistakes for the imperfect English.Thanks for what you let me know, because sometimes we talk about it among friends. Have a good sunday from RAF. Thanks for your reply. I did some research about the word ‘Kangaroo’. According to an Australian linguist R.M.W. Dixon, who wrote “The Languages of Australia” (Cambridge, 1980), the word comes from an Aboriginal language and it means Kangaroo. So I think the idea that ‘Kangaroo’ means ‘Welcome’ is probably not correct. Don’t worry about your mistakes. We all make mistakes when we learn a language. You are doing very well with your English. The main thing is to be understood. Hello Rob, I write from Italy, first of all thank you for the beautiful podcasts you do and then tell you that since I was in Australia in 2010, your country entered my heart. My son married a compatriot and your lives in Sydney, the beautiful city ‘that seems to be competing with Melbourne as the same from us between Milan and Rome. World and ‘country we say Italian, but I think the same thoughts you do it. Thanks again for podcasts and a friendly greeting from ‘Italy by Raf. Many thanks for your message and for your kind words about my podcasts. It’s great that you could visit Australia and especially Sydney, which is a great city. I would love to learn more about the rivalry between Rome and Milan – two great European cities. I am glad that your son lives in Sydney. It means you will always have a place to stay when you visit Australia. Thanks, and good luck with your English. You are doing well! Because it was against one team of my country in the final match ?. Anyway I’m one of your fans. I’m in Melbourne and I recommended your website to our English class and he shar it many times with the students. Many thanks for your comment. I’m glad that you like my podcast. I hope that your country’s team does better in this year’s Asian Champions League. Thanks also for sharing my podcast with your English class. Hi Ray. Many thanks for your comment. Yes, the Socceroo matches always create a lot of interest across a wide audience in Australia, including Aussie Rules fans.